Full of whimsy and magic, THE CAT RETURNS is another captivating tale from the renowned Studio Ghibli. 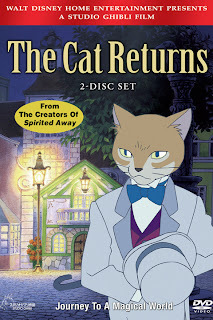 A spin off of WHISPER OF THE HEART, THE CAT RETURNS features the Baron (a magical cat statue) and Muta from the previous film but, unfortunately, not Shizuku. The protagonist in THE CAT RETURNS is Haru, a young misfit, who longs for love and acceptance. After rescuing a cat from being hit by a truck, Haru realizes she has the strange ability to speak to cats. She comes to find out that the cat she rescued is the son of the Cat King. In order to “repay” her for her kindness, the Cat King decides to kidnap Haru and force her to marry his son. Haru enlists Muta and the Baron to help save her. After writing that synopsis, I realize how childish the plot sounds but it’s more entertaining that it may seem. Being only 75 minutes, the film is short but doesn’t lack in adventure. I have to be honest, though, as I didn’t find Haru as compelling of a protagonist as Shizuku in WHISPER OF THE HEART. Other than the two shared characters, the two films have very little in common, each veering in its own direction with THE CAT RETURNS being much more fantastical than WHISPER. The visual style in THE CAT RETURNS is typical of the anime genre but that works well with some awesome fantasy sequences and general atmosphere of the film. I found THE CAT RETURNS fun and quaint. It has a solid message and tone but it’s not as riveting as some of the other Studio Ghibli films. However, I would still recommend this to those looking to see more anime films. 2 1/2 out of 4 stars.